Jeff Lemire ranks as one of my top favorite creators of the past 5 years. Books like Essex County and Descender have been some of my favorite comics because of Lemire’s ability to tell a story with a ton of heart, like yesterday’s Pride of Baghdad. Sweet Tooth vol. 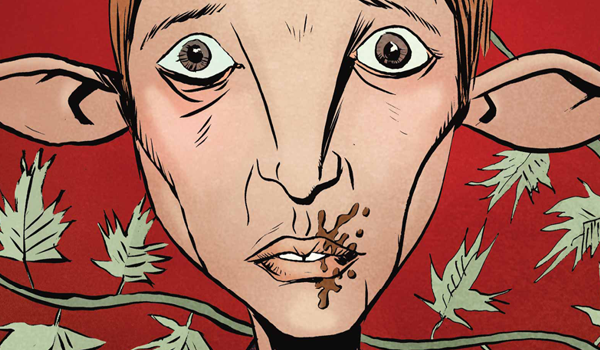 1 – Out of the Deep Woods, though, didn’t resonate with me quite how Lemire’s other creator-owned books have. That said, it’s still a book with a lot to teach. Across Lemire’s books that are both written and drawn by him, there tend to be lots of quiet pages. In Sweet Tooth, like in Essex County, there are stretches of pages that have no words and that feature a series of images that set a tone, mood, location, and (most importantly) a sense of quiet. In a book like Sweet Tooth vol. 1, which takes place in the deep woods, that sense of quiet is incredibly eerie and lonely. This evokes in the reader the same sense of isolation that the character is feeling. One thing that Lemire did in this book that I thought had great effect was that he bisected a single panel into two panels. Often on close-ups of faces, he cut a panel in half with a gutter, creating two panels from a single image. In talking scenes, this created a sense of a small passage of time between, say, a question and a response. This also had the effect of making the page as a whole a bit more visually interesting.